What follows is the Calendar’s entry, which comes verbatim from the Aug. 23 London Times. 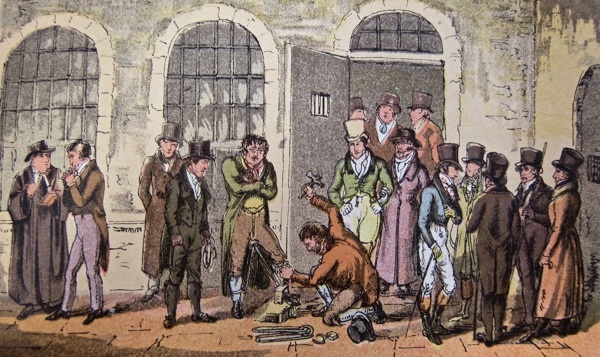 He was apprehended for a highway robbery, and convicted at the Old Bailey, when he received sentence of death. 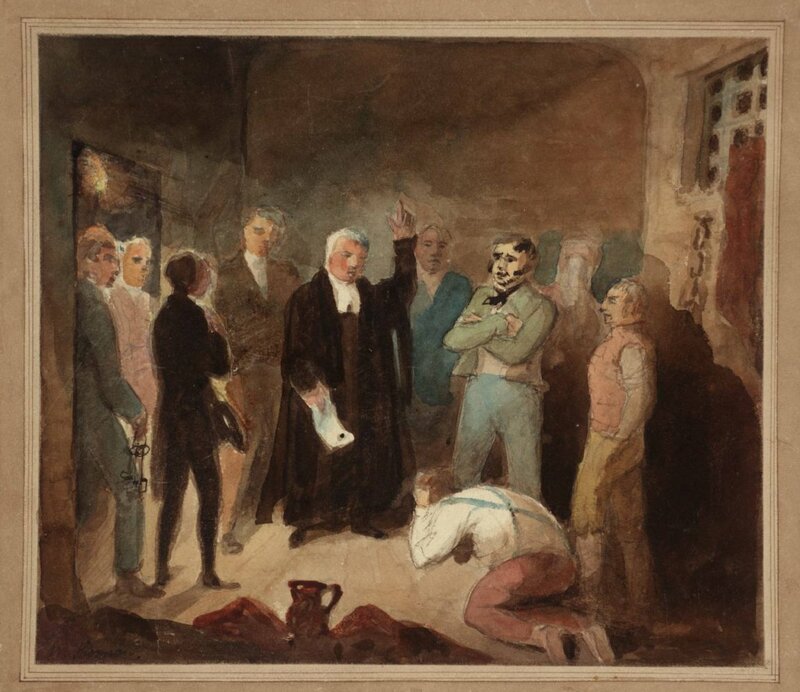 From the time of his conviction, he either affected, or suffered, complete insanity; but this did not release him from the consequence of his sentence; and, on Monday, August 22d, 1814, he was executed in front of Newgate, along with William Henry Lye, for burglary; John Mitchell, for forgery; Francis Sturgess, and Michael Mahoney, for highway robbery; and John Field, alias Jonathan Wild [not that one -ed. ], for burglary. By half past six o’clock the Old Bailey, and houses adjacent, were crowded to great excess. At half past seven Mahoney was brought forward, for the purpose of being disencumbered of his irons. While his irons were knocking off, it was found necessary to search for a knife to cut some part of the cordage, which confined the irons. Mahoney, seeing this, stooped, and, with an Herculean effort, tore it asunder. This being the only Catholic, the Rev. Mr. Devereux attended him in constant prayer, in which he joined most fervently. Sturgess, Field, and Mitchell, conducted themselves with great propriety. The unfortunate Ashton had been in a state of insanity since the receipt of the awful warrant for his execution. In the Press Yard he distorted his countenance horribly. He was the fifth who mounted the scaffold, and ran up the steps with great rapidity; and, having gained the summit of the platform, began to kick and dance, and often exclaimed, ‘I’m Lord Wellington!’ The Rev. Mr. Cotton, who officiated for the first time as Ordinary, enjoined him to prayer, to which he paid little attention, and continued to clap his hands as far as he was permitted by the extent of the cord. Mitchell often invited him to prayer. All that could be done was ineffectual, and it was necessary to have two men to hold him during the awful ceremony. When they released him for the purpose of the Lord’s Prayer being said, he turned round, and began to dance, and vociferated, Look at me; ‘I am Lord Wellington!’ At twenty minutes past eight o’clock the signal was given, and the platform fell. Scarcely, however, had the sufferers dropped, before, to the awe and astonishment of every beholder, Ashton rebounded from the rope, and was instantaneously seen dancing near the Ordinary, and crying out very loudly, and apparently unhurt, ‘What do ye think of me? Am I not Lord Wellington now?’ then danced, clapped his hands, and huzzaed. At length the executioner was compelled to get up the scaffold, and to push him forcibly from the place which he stood. Quite a baptism for the Rev. Horace Salusbury Cotton’s very first gig as the Ordinary. Cotton noted Ashton’s remarkable behavior in his execution diary; the relevant pages can be seen here. 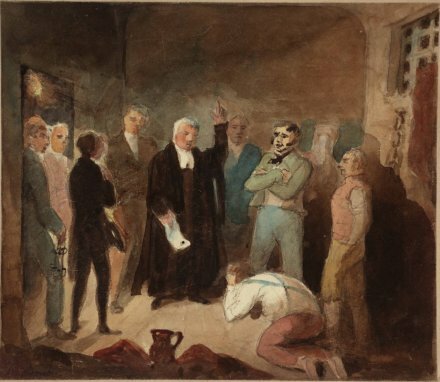 Dr Cotton, Ordinary of Newgate, Announcing the Death Warrant, by a prisoner named W. Thomson. This 1826 watercolor is at the Tate gallery.